Please note: This film does not come with Public Performance Rights. If you wish to a screening outside of a face-to-face classroom setting, please contact us. In 1937, the science fiction writer H. G. Wells imagined a "World Brain" containing all of the world's knowledge, accessible to all people, that would be "so compact in its material form and so gigantic in its scope and possible influence" that it could transcend even nation states and governments. Seventy years later, Google set about realizing Wells's vision, launching a massive project to scan millions of books from university library collections. But when it was discovered that over half of the first ten million books Google scanned were still in copyright, authors from around the world joined together to wage a fierce legal battle against the Internet giant, culminating in a dramatic courtroom showdown in 2011. 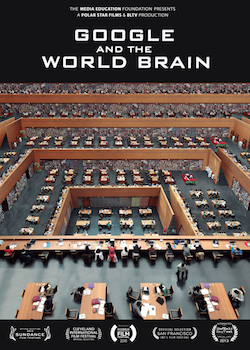 In gripping detail, Google & the World Brain tells the fascinating story of this complicated struggle over intellectual property and access to human knowledge, offering crucial insights into broader debates surrounding data-mining and privacy, downloading and copyright, fair use, freedom and surveillance. DVD includes the feature length documentary, as well as an abridged version shortened for use in the classroom. "This beautifully shot and carefully conceived documentary problematizes the role the Google Books project has played in our society. Whether you are a supporter or a critic, Ben Lewis' timely and highly engaging film will provoke you to think more deeply about the future of the digital world. Highly recommended!" "This report on Google's audacious project to digitize, and control, all of society's recorded knowledge is authoritative, balanced -- and absolutely chilling." "This short documentary draws attention in a compelling way to the long term global risks and benefits of the Google Books Project." "If you don't trust Google, watch this movie." "Endlessly fascinating and engaging. It's probably the best documentary you'll see all year." "Four Stars. A fair, interesting, and eye-opening true story. Anyone interested in the future, Google, books, Artificial Intelligence, where science fiction collides with reality, or a culturally relevant story well told, should see this documentary gem." "Offers convincing reasons to pay more attention to Google's utopian schemes."